For the third year running, brighterkind is delighted to be recognised as one of the most highly recommended care home groups in the UK. The independent carehome.co.uk Top 20 Care Home Awards 2019 highlight the most recommended Care Homes in each region of the UK. 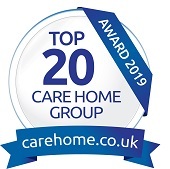 The carehome.co.uk Top 20 Care Home Group Awards 2019 highlight the most recommended Care Home Groups in the UK. The Awards are based on The Group Review Score as of 31st January 2019. The Group Review Score is derived from the average of all the Review Scores of its Members with a Review Score. brighterkind has an exceptionally high score of 9.5 out of ten across its 70 care homes in the UK. Lorraine McGarry-Wall, Chief Operating Officer for brighterkind, said: “It’s a credit to the dedication of all our care homes that the very positive comments and recommendations have placed brighterkind as one of the most highly recommended care groups in the UK"
The independent reviews are submitted by residents, family and visitors to the UKs largest online care directory. The carehome.co.uk website is the most used online care directory used by families to determine care options for loved ones. Reviews and recommendations are an important way to determine whether a home is viewed positively by it's service users. To find a brighterkind care home near you, search using Find a care Home.